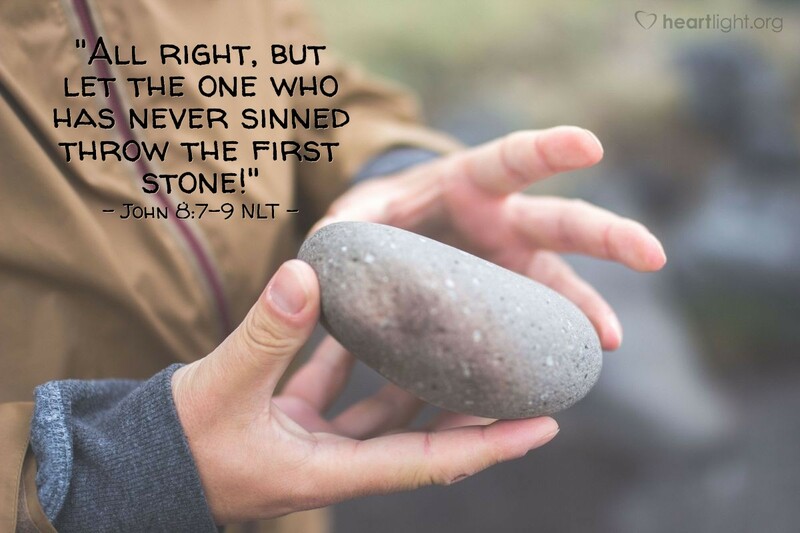 [The Jewish leaders] kept demanding an answer [to their question about the woman caught in adultery, so Jesus] stood up again and said, "All right, but let the one who has never sinned throw the first stone!" Then he stooped down again and wrote in the dust. When the accusers heard this, they slipped away one by one, beginning with the oldest, until only Jesus was left in the middle of the crowd with the woman. A lynch mob doesn't want truth. It doesn't want redemption or righteousness either. With the shame of the woman, the Jewish leaders had tasted blood. Now they planned to press on until their desire was satiated. It appeared as if no word could hold them back. They would press Jesus till they had what they wanted. But then Jesus spoke a word they had not expected. It was a heaven-sent word. It was a word rooted in truth and a word that struck their very souls. They knew they were not sinless. This word of truth penetrated to the hearts of those who were mature and knew both life and law. As Jesus glanced away to write in the dust, he gave them permission to leave without being shown up. For a brief moment, righteousness triumphed over hatred and self-importance. Those who were younger followed the example of the older men, leaving the woman protected and safe with Jesus. Redemption in action. The Gospel portrayed before our very eyes. Jesus takes the hate of hell and our own sin and turns back the foe, leaving us safe and in his presence. How can I thank you, dear Father, for the salvation Jesus has purchased for me. Lord Jesus, thank you! The words seem so shallow and so small before your expansive grace. Use me to be a conduit of that grace to others. All glory to you, O Father who reigns above all, and to you, Lord Jesus, for you have triumphed over sin and death to rescue me. Amen.